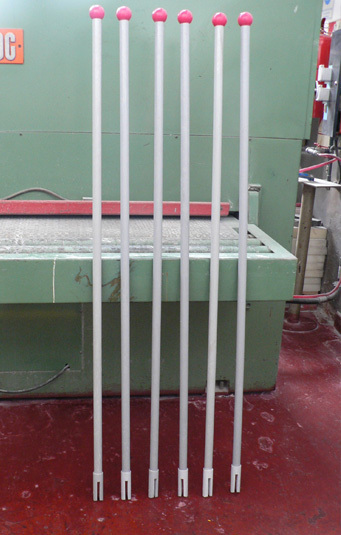 Fiber-polyester rod or glass – Imavolt S.A.
All rods are produced by this system where the reinforcing threads are from a creel or Cantr “and connected in parallel pass through a comb that gives the density and then by impregnation Cuba where they are impregnated with resin and then system by a juicer. Then pass through a drawn or matrix that gives the form and start the process of filificación, completing the cycle of polymerization in an oven at proper temperature. This process yields parts with a high percentage of glass or modulus of elasticity Alene. The system is used for rods, profiles, for a multitude of applications in the electromechanical industry, ripples springs, antennas for cars, etc. Ripples angles and springs as needed.